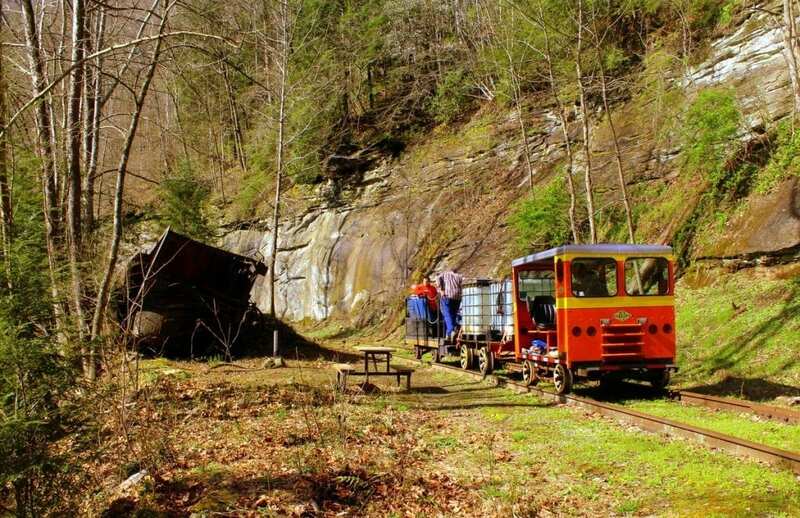 Passengers pass an old wreck on the old Buffalo Creek & Gauley Railroad, now an excursion line in central West Virginia. Thousands of miners and loggers once lived in the little valley through which West Virginia’s newest rail excursion runs. Trout swim and deer browse where a century ago striking miners bombed the line that rail-bikes and little engines now follow. Peace, quiet, and history are chief reasons more than 1,200 guests pedaled or boarded open coaches on the old Buffalo Creek & Gauley Railroad in 2018, and thousands more are expected this year as word of the excursion spreads. 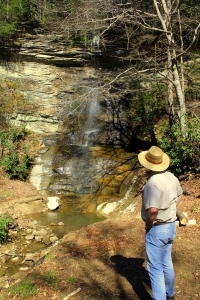 David Sibray explores Devil’s Sawmill Falls, a popular stop. Officials aren’t entirely sure why the new attraction has gained so much attention, but all indications are that it will continue to do so, says Mitch DeBoard, executive director of the Clay County Business Development Authority. “Riders talk about the stream and how clear it is and about the waterfalls and how beautiful they are and about the graveyard and the cliffs, but it’s the whole experience that seems to move them,” he says. DeBoard and volunteers spent Wednesday morning stocking Buffalo Creek, the glimmering tributary of the Elk River that the line follows into the hills from the county seat at Clay, a 20-minute drive from I-79 north of Charleston, West Virginia. 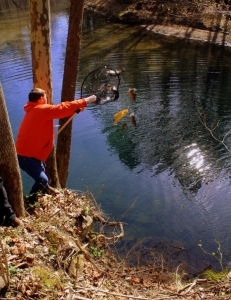 The stocking of more than 250 pounds of trout—acquired from nearby Indian Lake Fisheries in Elkview—is part of the initiative to attract visitors to the region. Anglers are welcome to fish the sparkling stream or board the train to one of many holes and riffles along the way. Volunteerism is also part of the formula that’s made the rail initiative work, DeBoard said. Joe Wood, Jimmy Rapp, Derrick and Rodney Nutter of Black Diamond Power were on hand to help stock trout that morning along with Peggy DeBoard, guide Dustin Fitzwater, and Debora Saulsgiver, vice-president of the authority. 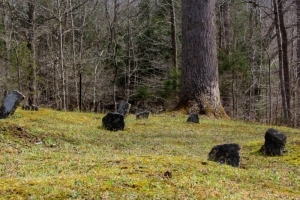 Aside from a dirt road that leads out of the hills to a cemetery along the line, no other access is provided into the valley, which is also what seems to attract many visitors. Fieldstones mark graves at Adair. The railroad was established by J.G. Bradley in the early 1900s and was operated by the Elk River Coal and Lumber Co., which used steam engines from 1904 until 1967, and was one of the last all-steam lines in the U.S. Beds of daffodils and yuccas appear in the woods where houses once stood, but few people now come into this part of the valley, with the exception of anglers, hunters, and rail passengers. Derrick Nutter stocks trout along route. Excursions in 2019 are being conducted at 9 a.m., 1 p.m., and 5 p.m. Thursday through Monday and are $25 per adult and $15 per child 12 and younger. Despite its wooded location in the mountains of central West Virginia, the line is easily accessible, and is a drive of an hour east from Charleston and two hours south of Clarksburg, West Virginia. Prospective riders are encouraged to call 304-618-7992 or visit the excursion website, Buffalo Creek Trail. Read also: Pedal-train excursion leads tourists into remote central W.Va.
Pedal-train excursion leads tourists into remote central W.Va.